Everything a writer needs to know about storytelling can be summed up in the image of a journey by car. Narrative is the vehicle; the driver’s seat belongs to the writer. The reader is the passenger. 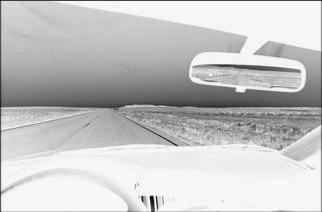 First, there is the journey’s context : the forward perspective of the windshield, interiority, presence, and the backward perspective of the rear-view mirror; surrounding all that is place or setting. Past, present, and future are concurrent, though not simultaneously apparent. Ahead it’s at once familiar and unknown. Even landscapes seen countless times before are never certain, never fully understood or seen in their entirety. Anything can happen, anything can come at you and from all angles – head-on or t-boned, or running up from behind. The mysterious can appear momentarily in the flash of a headlight, out of the corner of an eye, changing the atmosphere from pleasure to terror, from fear to relief. In that blind space where the horizon meets the road all stories are still a surprise yet to be encountered. Behind is defined by what has passed as much as the aspect of it not seen before. Let’s not forget, too, about occupants. It is an endlessly changing setting. It’s transformative. There is a beginning and an ending to the journey. This is story. But the storytelling environment is still incomplete: to inhabit the vehicle of narrative without one’s own eyes reflected in the mirror – to write without deep psychical reflection and thus see one’s own engagement with the life out of which story erupts is to ignore all that has made great writing part of a living literary space. The writer is the one looking out and looking back. The writer isn’t just driving; he or she is in the story. It’s his or her unique point of view that informs, that provides all the fresh details and epiphanies along the roads we’ve all traveled before, and guidance through the terra incognita we may never know about outside this journey. Who you are as a reader when the writer turns the key in the ignition is never the same you when the motor is cut. Neither is the writer unchanged. Much theory has been written about the place a writer holds in the value of the completed narrative. Some argue that to read the writer into text is inconsequential and even damaging to the discrete experience of the art and artistry itself, but that is a post-publishing argument that holds little sway on what happens during the writing process. The truth is, even commissioned work is deeply informed by the writer. Get in the car and give your readers the ride of their lives. You’re the driver. You’re the guide. You can either make it so unbearable with pointless nattering and irrelevant trivia that they’re willing to open the door and do a tuck-and-roll into the gravel shoulder just to get away from you, or you can awe and inspire them so they’ll never forget what you did by letting them in the car. Know who to travel with: It’s awkward being on a road trip with the wrong people. There’s a huge difference between travelers who want to see the Nevada desert and those who just want to get to Vegas. Know your audience, people. Don’t invite a Cormac McCarthy fan on a Harlequin tour. Know what kind of ride you’re offering: If you don’t give your passengers a sense of where they’re going, they might pack babushkas and find they really needed bikinis and speedos. That’s not good for anyone. When they have an idea of what’s going on, it’s easier for them to sit back and enjoy the scenery. So if your story is an international intrigue, set it up from the first chapter. Get the tension and players in there fast. If it’s a character-driven historical epic, there’s more leisure to build up the world. But like the road trip, if by the tone of your first chapter or scene your readers were expecting a suspense-packed run through the streets of Mogadishu but are finding out about protagonist Johnny’s first loose tooth and some back-story about how his mom & dad met and got the farming business started – there’s a problem. Look over there, in the passenger seat: see how your reader’s hand is curling into a fist? She’s getting ready to punch you, and if she bails at the next greasy spoon off the highway she’ll never take a ride with you again. Get a tune-up and wash before you go: Departing with your machinery in order creates the best chance for a smooth, enjoyable, breakdown-free journey (yours and the car’s). Put your narrative in order. Outline. Plot. Create structure. Clean up adjectival and adverbial dirt and debris. Get rid of the weird sounds. When you turn the key, the engine must start and stay started. Cleanliness is next to writerliness: Nobody wants to be trapped with your BO. Don’t make this trip about your various means of offense: personal problems, political bias, racism, idiocy, purple adjectives and adverbs. Take control of yourself, take control of your story. Of course, you can go ahead and do it anyhow but the only people who will voluntarily go on your journey will be those who like BO as much as you do. In other words, if you want great people to get in the car, and a lot of them, don’t stink it up. Be an entertaining tour guide: Imagine getting into a car with a driver who points out every minute detail along the way (Oh, look, another squirrel pancake), announces every move they’re about to make (I’ll be turning left up there at the left turn signal), misses the authentic regional gems (Hey, there’s the Golden Arches! Let’s eat! ), and seems to know nothing about the history of anything (Nah, Gettysburg sounds boring). Then there’s the driver who goes on and on about the post-structuralist blah blah blah (Aren’t you a stupid little lemming on your brain-holiday when you’re really marching inexorably to your own state-prescribed death? Idiot.). Zzzzz. Give this ride some heat, for crying out loud. Choose the kind of story you want to tell, and how you’ll tell it. Focus on what’s important. Don’t be obvious about what’s coming. Let the reader be taken by the mystery. Be original. Be authentic. Be unique. Challenge readers, change them. Use what you understand, and if possible make the most of your own backyard so your story doesn’t sound like everyone else’s out there. Don’t resort to what’s been done before. Put your heart into it, but give your audience something to think about too. Know the world your characters occupy, and how it has influenced their personalities and choices. Don’t treat your readers like idiots. Be the source of energy and light. Expose. Enlighten. Entertain. Then you’ll stand a chance of getting $20’s stuffed into your waistband by appreciative fans at the end. Don’t get run off the road: Being aware of the environment and the rules of the road means less chance that your passenger will be ejected through the windshield. Keep your eyes on the road, and don’t spend too much time looking back. Backward is for spatial orientation, not for navigation. It’s impossible to move forward when you’re spending most of your time and efforts staring in the rear view mirror. This is not the same as knowing the kind of road trip you’re offering. This is about losing your plot, and making it impossible for readers to get back into the story. Readers don’t like being in the death seat, so don’t put them in a position where you’ll lose them after a few kilometers chapters. Bodily functions can’t be ignored: People eat on road trips. They drink. They use toilets, belch, and fart. But guess what, they smell things, and have attitudes, reactions, and feelings. Give your characters a real life. Use all the senses – smell, taste, touch, sound, sights, and even that tingling spidey sense. When that guy in the back seat pulls out his gluten-free organic barksicle that smells like armpits, that tells you something important about who he is. It also tells you something about his fellow passengers how they react when he takes it out. The boozehound who thinks she’s hiding her flammable breath with a pack of Fisherman’s Friends? Ditto. Use details with purpose. Tell readers who characters are by what these little details of life say about them – doesn’t matter what, just make sure all your characters live and breathe, not just the protagonist. And when you give them some snackage make sure we can taste it too. Backseat drivers need not apply: This is not a democracy. Someone’s got to be making the big decisions, otherwise the journey becomes a dog’s breakfast (ie: possibly a meal of it’s own vomit). Writers, don’t let the publishing industry tell you what kind of story to write. Don’t let your friends or family or fellow writers dictate, influence, or shame you into altering tone, style, genre, or voice that isn’t you. This is not the same as letting an expert or a trusted beta reader shape your story and making it the best one possible – for you. If someone advises you, listen because they’re right and because it makes the story better, not because you don’t have confidence in your own work. Because whose journey is this? Yours. Who’s in the driver’s seat? You. Everyone else is along for the ride. Don’t get stranded: If you don’t plan, and you don’t have a way out of a dead end or a bad situation, the journey’s doomed. Readers don’t want stories that stall. This is not about genre or plot, it’s about pacing and momentum. Keep it moving. Get rid of non-essential scenes, characters, or plot choices. Use active verbs over passive. Let your people DO things instead of having things done to them, or observing, or remembering. Americans landed on the moon: subject-verb-object. If the driver doesn’t know how to get out of it, don’t expect the passenger to hang around to take over navigation or fix the flat for a story that came to a grinding halt 150 pages from the end of the book. Leave room for the unexpected: Don’t be predictable. Be open to those amazing discoveries that aren’t in the guide books or maps. This is what makes the journey unforgettable. Be unforgettable. Do it for your readers. It will reward you as much as them. Great advice. You have a different perspective but it makes perfect sense to me. Thanks. Thank you for your comment. Different works for me if it works for writers.